- Reduces wear and breakage for longer blade life. 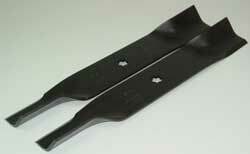 - Ensures that only the best blades are used. · John Deere blades are designed to exact specifications for the individual mower to ensure optimum performance.